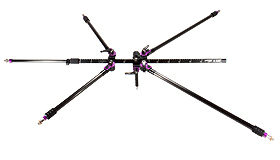 The construction uses a central rectangular axis, telescopic arms and special sliding nodes with toothed flanges and quick release skewers that provide fast and easy set up. By arranging the nodes in plane or perpendicular, it is possible to create well known multiple microphone configurations such as Decca Tree and others including experimental 3D arrays. The experimental character is emphasized by the possibility of adding more nodes to achieve setups with 7, 8 or 9 microphones. It is also available as a kit version (A-RAY-S) that includes a “QuickLok” quick release tip (QRT) and “MikeLink” vertical swivel (QAVS). 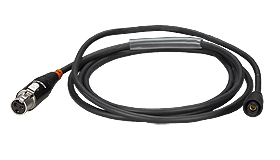 An optional 6-channel breakout box with detachable multicore snake and customer-configurable microphone leads allows for standard microphones and Colette systems alike. Accessories for rigging can be provided on request. 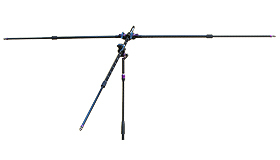 The A-RAY can be supplied with a shorter central axis and arms of different lengths to suit customer wishes.